Pamplemousse is a grapefruit. He’s upset and lonely. His mouse neighbours aren’t very friendly unless he’s crying sweet juicy tears and what makes it worse is he can’t squeeze through their mouse hole to try to get to know them. Will he ever find someone who likes him just as he is? 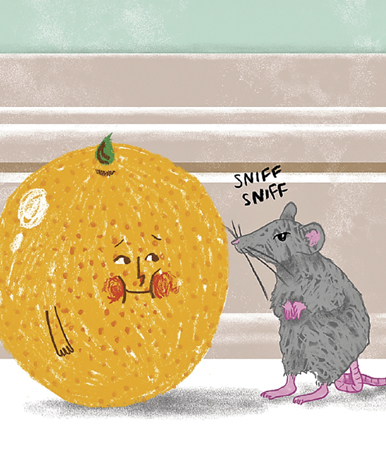 ‘The Chronic Identity Crisis of Pamplemousse’ is a new 30-minute opera written for Key Stage 2 children with a positive message about friendship and self-confidence. Children will get the opportunity before the performance to take part in an hour-long interactive workshop where they’ll be able to explore the music, themes and characters of this exciting new work. Let your imagination roam free with Northern Ireland Opera! This event takes place in our Studio Theatre with an unreserved, tiered seating layout. Suitable for Children of Primary School Age.